One of my biggest worries when Zoe got her glasses was how she would do with her glasses when she was at daycare. While they’ve always been wonderful with Zoe, I was sure that they would not be interested in spending all day fighting with her to get her to keep her glasses on. When we first got Zoe’s glasses, I asked my source for glasses advice (the lady at the glasses shop) if she had any advice for me to pass along to her daycare providers. The woman just told me that her teachers would have to figure something out. That was the one time I got completely unhelpful advice from that shop. 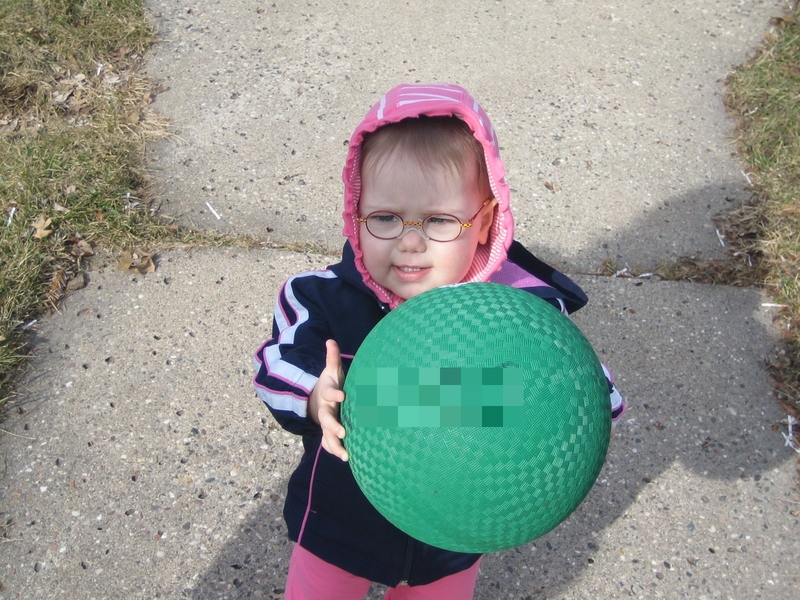 I also hoped that since I was home with her the first week she had her glasses, that she’d be a spectacle-wearing pro when she went back to daycare. Alas, it was not to be. There were days, those first weeks, when they weren’t able to get her to wear her glasses, and we’d find them sitting in her cubby when we picked her up at the end of the day. Luckily, she started wearing them reliably within a few weeks, so that part didn’t last long. Still, knowing that she and her glasses were out of my control added stress to an already stressful time. When should your child be wearing his or her glasses? Or maybe it would be easier to tell them when the glasses are allowed to come off (for example: nap, bath time, face washing). What do you want them to do when your child takes off their glasses? This includes what to do with the glasses during nap time, or other times when your child should not be wearing glasses, but also, how should they handle your child not wanting to wear their glasses. Make sure they understand how vital wearing glasses is to your child’s visual development. Since a lot of farsighted kids can function very well with glasses, it’s easy for someone to think they don’t need their glasses. Make sure they know how to help your child take off and put on glasses (using both hands). Ask them to keep an eye out for dirty lenses and make sure they know how to clean the glasses without scratching the lenses. Are there any activities your child should not be doing because of their vision? Or any activities that might be particularly difficult? Make sure they know about it and talk with them about ways to help your child during those activities. If your child patches, how long should they patch, when, and what should they do with the patch when your child is done? In this case, you should also keep them up to date on how well your child can see when patching. There may be some activities that are too frustrating, especially in the beginning with patching. If your child wears contacts, you should provide similar information about when and how they should be removed. Are there any things having to do with your child’s vision that you want them to watch out for (for example: eyes not straight, squinting, looking over the glasses)? Make sure they have contact information for your child’s eye doctor, and under what circumstances should they be contacted. If something does happen to the glasses (or contacts), what do you want them to do with the wreckage. Glasses cleaning cloth and cleaning spray. Prescription sunglasses or clip on sunglasses if necessary. Same with sports or swimming goggles if they’ll be needed. Extra patches, if they’re patching. Contact cases and solution if they wear contacts. My son is short sighted and his old teacher would take his glasses off when they played sports – I understand that she didn’t want them to get broken but it meant that he couldn’t see what was going on! His current teacher is fantastic – she keeps an eye (no pun intended!) on him and only two weeks ago sent a note home saying that he seemed to be having trouble seeing in class. Luckily he’s seeing his sister’s PO for the first time next week (before he was under an ophthalmologist in our town but he wants him to see a specialist) and the appointment was already booked! My daughter is three and is still at home with me (I work from home) but will be starting school in September (we live in Europe) – she has a trial day coming up at the end of June and once we know who her teacher is I think that I’ll make an appointment with them to explain her vision problems and how they can help. I’m so pleased to find this site! Oh no! I think it would be more dangerous for him to play sports without glasses than with them! We do have Zoe take off her glasses when she goes in a bouncy castle (it’s one of the rules on the bouncer), but since that never happens at school, it’s not a big deal. So glad he has a good teacher now who’s watching out for him now. Zoe’s teacher also noticed that Zoe was starting to look at everything through the edge of her glasses – turns out she needed a new prescription. Good luck with your daughter starting school in September! Great post! We were wondering the same things when our two and a half year old started wearing his glasses. I don’t have anything to add to your list. Our biggest things to share with his daycare teachers were the rule that the glasses had to be given to a teacher if they came off and that it was okay to leave them off for sports (a recommendation of his doctor’s). We also found them in his cubby a lot that first month or so, but I decided that was my own problem not theirs. Luckily once he got used to wearing them at home, they stayed on at school as well. We also let him pick out his own glasses case which still goes to preschool everyday as the repository for glasses at naptime, etc. Thanks Katy! Interesting that your doctor recommends not wearing glasses with sports. I suppose it depends a lot on the sport, we’ve always had Zoe wear her glasses, since I think she’s more likely to get hurt from not seeing well. Good idea on letting him choose a glasses case to take to school! Sorry, I should have clarified… he doesn’t need his glasses during rough sports because his astigmatism isn’t that pronounced (yet). So, in his case, the doctor said it’s okay to leave them off for short periods like that. I’m sure it completely depends on the child and their prescription, but it’s probably an important point to cover with your daycare providers just for this reason! Ah, that makes sense! And yes, that’s a fantastic question to have on a list for the doctor, and a good point to clarify with child care providers, too! I often find my son’s glasses to be really dirty. So I would add, to ask the teacher to clean his glasses as needed through out the day. Sometimes it seems they just don’t think of it. Unless I missed it… a spare pair of glasses…in case. Toddlers being toddlers..sooner or later a pair of glasses may break due to play, a fall, etc. Having a spare pair on hand offers peace of mind…and limits the need to to go there in the event something happens. My son patches at preschool and we send him with a little mailing label sticker on his back indicating the time the patch should come off. We also asked that it be communicated to his peers that his glasses are his and should not be touched by his classmates. We have had no problems with his patching or glasses-wearing at school thus far.